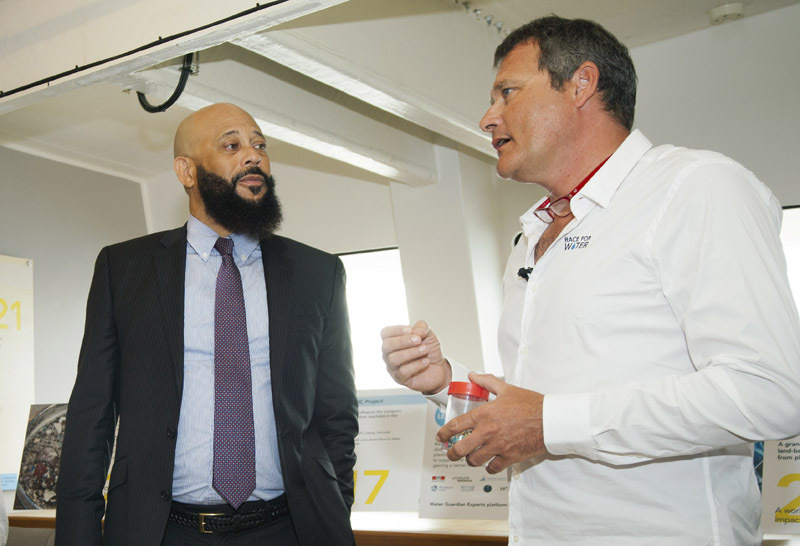 The Minister of the Environment Sylvan Richards today opened a Waste-to-Energy Workshop on board Race For Water, the solar, wind and hydrogen powered scientific vessel visiting Bermuda on the first leg of a five-year odyssey. 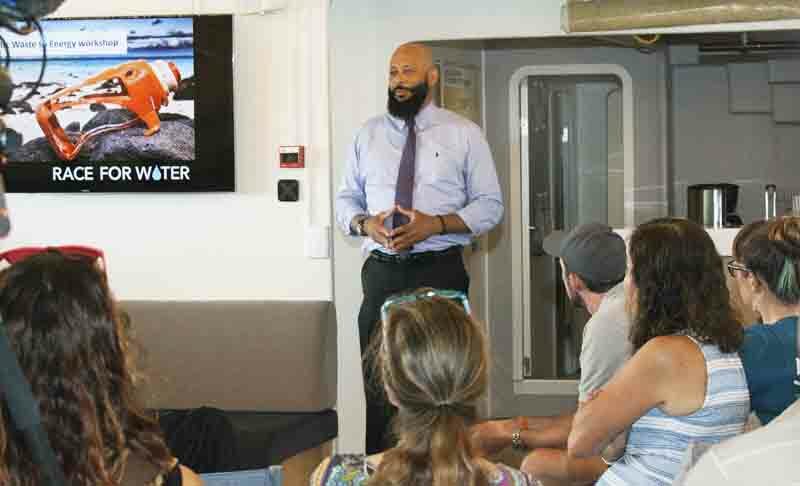 The workshop gathered local business leaders, Government technical officers, members of relevant Non-Governmental Organizations and Race For Water experts together to talk about plastic waste and how it is possible to turn it into energy. The goal of the Race to Water Foundation is to raise awareness and promote new solutions to fight plastic pollution in the oceans. Minister Richards was welcomed by Race For Water Foundation President Marco Simeoni. Minister Richards stated that Government is working to fulfill a Throne Speech initiative this year by publishing a Green Paper on the problem of plastics in our environment. “The aim is to reduce the use of, and the toxic effects of, plastics on our land and in our surrounding waters. About 80% of marine debris is made up of plastic, with the equivalent of a dump truck full of plastic entering the ocean every minute,” the Ministry said. In addition to the workshop today, Race For Water experts are holding workshops for middle and high school students from 8 June to 13 June. These workshops will increase awareness of the growing epidemic of plastic pollution in our oceans, and explore some new ways in which we can begin to heal our oceans and improve our prospects for generations to come. The Race For Water Foundation has a three part mission: to contribute to the advancement of scientific knowledge on plastic pollution in the ocean; to share this information to alert decision makers, raise awareness among the public, and educate youth; and to promote action and implementation of practical solutions with an environmental and social impact. The vessel next heads for the Caribbean as it circumnavigates the globe.